70.5% of the electorate voted. Within the votes cast 8,613 were postal. We need to encourage inventors and entrepreneurs to flourish in Britain. So often they find themselves with a mountain to climb to get their ideas off the ground. Visiting Alvin Smith was a real pleasure and an opportunity to hear first hand of the difficulties he has faced in having his Searaser assessed. He spoke of having to wait for months to have an assessment and having to stall his project as there is no prospect of retrospective funding. Alvin argues that ‘where a working prototype has been privately funded to the point where it has been operating not in test tanks but in the open sea and performed perfectly, an appointed qualified engineer should visit the project, even if on dry land to see the device and potential, so that a report can be sent to the people making decisions in the hope good ideas with great potential for the UK do not get missed'. If you would like to look at the Searaser please look at his website. The Conservatives have a series of policies aimed at helping Britain's technology-based businesses remain at the cutting edge of international innovation. We have pledged to keep and improve research and development tax credits, increasing their focus on hi-tech companies, small businesses and new start-ups. We are keen to develop stronger links between business and academia, so that private funding can be used to support academic research and successful innovations can be brought to market more quickly. If we are to move to a low carbon future we need to do far more to encourage people like Alvin to succeed. Coastal communities are a vital part of the South Hams and nowhere is the threat of rising sea levels more evident than at Slapton. The beauty of Slapton Ley and the essential link formed by the Slapton Line are in desperate need of protection. I know that some people are expressing doubts about climate change and the threat of rising sea levels but I am in no doubt that that these pose serious risks for the future and that money invested now in protecting us from global warming is money well spent. Whilst climate fluctuations have always been with us, I feel there is clear evidence that CO2 levels are increasing and that man made pollutants are impacting worldwide to cause rising sea levels. Visiting the coast today and attending an open meeting in Slapton, I was struck by the number of scientists living in the area. Many people have written to me over the past few months about how we can protect the future of science in this country. I do think we need more MPs who have scientific backgrounds; this is an area that has been seriously under represented in the past. But we also need to protect investment in science teaching both at schools and at University and continue to fund pure scientific research. We must ensure that British innovators and entrepreneurs have the opportunities to develop their ideas and especially to capitalise on the area's reputation for environmental awareness by attracting investment in green technology. Following the public meeting I enjoyed meeting Thea, Dan and Kevin from the Tower Inn and dropping into the Queens Arms. These are both wonderful pubs in a small rural community but suffer from an anomaly that neither can benefit from rates relief as this can only benefit rural pubs if they are the sole premises. Rural pubs are struggling and, in my view, unless we can do something to redress the imbalance with ultra cheap supermarket alcohol, we will continue to see the loss of these hubs of community life. 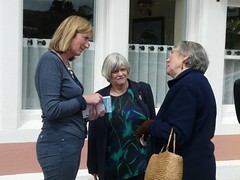 It was good to spend a morning with Ann Widdecombe visiting three fantastic coastal towns and listening to local views. Amongst others, mortgage issues for the self employed and problems with bank lending to small businesses were raised. Time and again in this campaign I have heard small businesses' concerns about the gulf between the private and state sectors; pensions and sickness benefits are clear examples of how the private sector and self employed are at a disadvantage. Effectively the private sector pays twice, once through taxation for public sector pensions and again into their own pension schemes, now decimated by Labour's stealth tax on private pensions. Business rates and the refusal of the government to reconsider the revaluations (even though the valuations were at the peak of the market) were again an issue affecting many businesses. Sandra Drew wanted to talk about local defence sector employment. I am very aware that the defence industry provides many jobs in the Southwest and local MPs need to support their survival. The issue of immigration arose many times today, with several people indignant that Gordon Brown accuses even lifelong supporters of bigotry for asking the question. Conservative policy is clear on this issue. Overall this was a great day with people enthusiastic to discuss their political views and give a warm welcome to Ann Widdecombe. 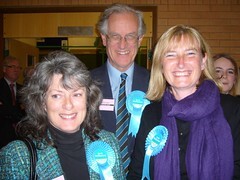 Village communities are the heart of the South Hams; they have suffered under Labour. The need to protect rural England is one of my core concerns and so it was a great pleasure to spend a day trying to meet as many people as possible and listen to concerns. At a public meeting in Ashprington I was questioned about many issues from local to national; issues like hunting, taxation, antisocial behaviour and trust in politics, to list a few. Over the course of the day many people talked about the problems facing farmers and their fears over food security. We now import so much of our food that we are in serious danger if anything were to disrupt transport links. Steve Hunt, agricultural credit broker, told me of the difficulties facing farmers who want to invest in their businesses and his experience of the decline in farming investment over recent years. Many farmers spoke today about the burdens of red tape, the incompetence and bureaucracy of the rural payments agency and the excessive power of supermarkets. The dairy industry in the South Hams is collapsing and the Government has done nothing to address the crisis of bovine TB other than to pretend that a small scale vaccination trial might somehow hold the key. Rural communities need village hubs and where better than places like the Red Lion in Dittisham? Brigitte Tardy refused to be thwarted by the closure of her post office and told me how she took over the pub, and with the help of a grant from the local council, has kept a post office service going in her business which combines pub, shop and post office all in one. Today I was discussing trust in politics with BBC radio Devon and the shadow that the MP's expenses and lobbying scandals have cast over this election. For the majority of people, these matters are incomprehensible and unforgiven. But the problem runs deeper than individual MPs out of touch with the real world.Many people feel that our current politicians have no relevance to their own lives. They sense that unelected quangos and Europe have more of a say than our own Parliament. I want to see greater power for local communities and and responsibility repatriated from Europe. I believe we need politicians with real life experience and integrity and support the Conservatives' view that dishonest politicians should be sacked. Who wants a federal Europe or to join the European Single Currency? No one that I have met. To anyone who feels that political parties are all the same, I would say look at our policies on Europe and beware the slide to federalism under Labour and the Lib Dems. Look at the situation in Greece, where national debt is out of control and being in the Euro restricts the ability to respond. It could happen here and only a Conservative Government has the determination to prevent it. Canvassing today with Tom King, former Secretary of State for Northern Ireland and for Defence was a great pleasure. 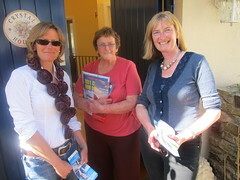 We visited Dartmouth Caring to hear about their work from Dee Nutt and met many businesses in town. Recently retired serviceman, Paul Conway spoke of the difficulties facing ex-servicemen in finding affordable housing. We must restore the military covenant and, as a forces child myself, I am pleased to see the pledges taken by the Conservative Party to guarantee a fairer deal for our service personnel. These include a doubling of the operational allowance, improved mental health services to help those returning from operational duty and dedicated wards for injured servicemen. 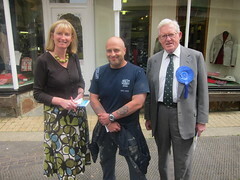 Out and about in Dartmouth today, I met Henry Bomby and I was so impressed by his commitment. Please visit his website and also look at 'Toe in Water' which does so much to support injured servicemen. Another full day canvassing local and national opinions in Dartmouth and Kingswear, followed by an open meeting in the evening at Kingswear Village Hall. It was good to see so many people wanting to engage in political debate and I sense the mood now turning away from cynicism towards a real interest in the outcome of the election. At Kingswear there was much debate about proportional representation and compulsory voting. Whilst only a minority favoured PR, about half those present wanted to see compulsory voting but with an option on the ballot paper for ‘none of the above'. Most people wanted to see more consensus politics with a less adversarial style. There was no support for all women shortlists but a general feeling that Parliament needs to be more representative of the wider community. In my view, open primaries are a better way of opening up Parliament than restricted lists. Perhaps more weight should be given to all party working groups and select committees, with members mostly comprised of MPs with relevant experience. I would like to see a Parliament with more clout; where announcements are made in the House of Commons and not via spin doctors on TV, and I hope that the next generation of MPs will take a stand against the excessive power of whips, which is the cause of so much of the mistrust in our political system.